Physician assistants on average earn an annual salary of about $92,460, and their average hourly pay is $44.45. Those who are in the top 10 percent of earners make around $124,770, while those in the bottom 10 percent earn about $62,430. Among the highest paying industries for this occupation are specialty hospitals, home healthcare services, office administrative services and outpatient centers. Top paying cities for physician assistants include Racine, WI ($145,860), Texarkana, TX-AR ($143,890), Tyler, TX ($127,160), and Gainesville, GA ($127,000). Bonuses vary depending on a number of factors, such as years of experience. 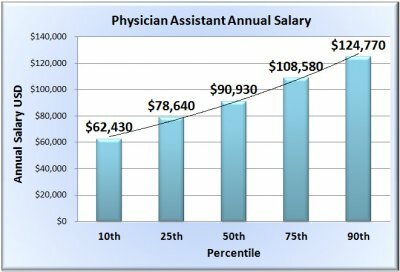 Physician assistants with less than 1 year of experience may earn bonuses of up to $512 per year, while those with 1 to 4 years of experience may earn up to $1,022. With more than 5 years of experience, a physician assistant may expect almost $2000 in bonuses per year. About 83,640 physician assistants were employed across the country in 2012. Physicians' offices, hospitals and outpatient centers are the primary workplaces for physician assistants. The employment rate of physician assistants is predicted to grow by 38 percent between 2012 and 2022. It is expected that 33,300 new jobs will open during this period.